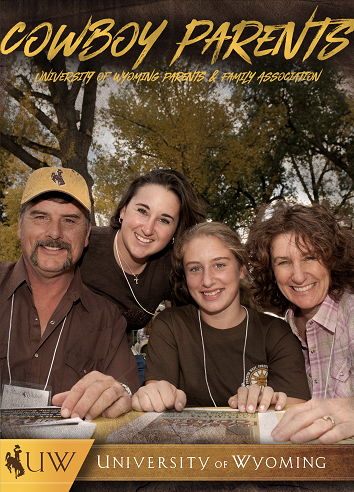 As the parent or guardian of a currently enrolled UW student, you are automatically a member of the University of Wyoming Parents & Family Association-Cowboy Parents. Cowboy Parents does not cost you a thing and offers many ways for you to get involved and stay connected and informed about what is going on at UW. As a Cowboy Parents member, you can register your email address to receive access to informative e-newsletters, email updates, an online parent handbook, and much more. Active Cowboy Parents members serve as volunteers and on the Cowboy Parents Council, which is a great way to partner with UW administrators and departments to promote student success. Founded in 1991, Cowboy Parents was established to recognize the essential role you play in the success of your student. Studies show that parental support is key to collegiate student achievement and that's what we are here for-to assist you in that important role. to provide the University of Wyoming with a unique parent perspective.